Patoranking: From Rags to Stardom. Patoranking proves that there is no shortcut to success but through hardwork and determination. The singer who is a household name in Nigeria and widely loved abroad went through some terrible hardships before attaining the position where he is today. Patrick Nnaemeka Okorie popularly known as Patoranking was born on May 27, 1990. Patoranking is an indigene of Ebonyi State, Nigeria. He is a Reggae Dancehall Singer and Songwriter. He grew up in Ijegun Egba a Satellite Town in Lagos but later moved to Ebute Metta, Lagos. He had his early education at Citizen Comprehensive College Epe, Lagos and later attended Jibril Martin Memorial Grammar School, Iponri, Lagos. 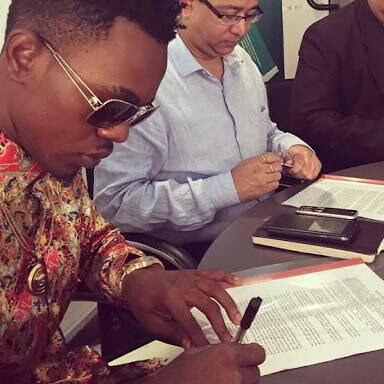 Patoranking began his career in the music industry as a street jam and carnival dancer when nobody gave him a chance. He has as his musical influences, artists like: Fela Kuti, Bob Marley, Tuface, Majek Fashek and some others. Before hitting it big with his hit song ‘Alubarika’, Patoranking once sold rat killer (rat poison) in the traffic of Lagos... and also did work as a bricklayer. He later moved to Ghana in 2007 after he was admitted into the Cape Coast University, but after a year at the university, he dropped out due to financial constraints and then moved to Accra where he spent most nights on the Streets of Osu in Accra, Ghana and dabbled into so many things to achieve his dreams. “A little story about this picture… five years ago, I left my little brother Rapha and my little sister Sharon because I wanted to change the face of my family… I could not give them the much deserved elder attention, I had to do that because I want to be able to provide their needs and answer their questions in the future. Thank God for today and thank God for His blessings upon my family… Everyone is happy and we are living the life. “The only option I had” at that point “was making it in life because I just had to change the course of my family, the face of my family you know… being the first child... I just say thank you Lord and to everybody that never doubted me. I pray for them still and we’re still together,” he added. In Accra, Patoranking met a young Ghanaian entrepreneur named Lanky, off the streets of Osu who was ready to partner with him to achieve his dreams. Lanky started a production company called ‘Black Rhythms Entertainment’ and made a few tracks with Patoranking. According to the ‘Up in D Club’ star, although the songs enjoyed some airplay but, it was difficult to break through in Ghana so he came back to Nigeria upon the invitation of a friend. Back home, he got signed up on a record deal with a producer named K-Solo Solo’s Igberaga Records in 2010, releasing “Up in D Club” under the outfit. K-Solo exposed him to a wider Nigerian audience, but he still remained an underground performer until he had his big break after he collaborated with Timaya on his track Alubarika. “For two years I’ve had about 120 collabos with people, (including: artists such as XProject, Konga, Slam and Reggie Rockstone). I was just working hard I wasn’t working smart, that’s the difference. Talent plus hard work yields to nothing. Talent plus money yields success,” he said light heartedly. Patoranking revealed in his song, ‘Nothing to Something’ was the chronicle of his life. On September 12 2013, he released the video and audio for “Alubarika” simultaneously. The song which literally translates to “God’s Blessings” and features vocals from Timaya was just the starting point of blessings overflow for the young talented man. The music “Alubarika”, shot by AJE Films is a summary of Patoranking’s life as a musician. He also said that the song opened doors for him in terms of building a fan base and working with established musicians. His hit single titled “Girlie O: shot him to limelight in February 2014. This hit single was born out of him signing a record deal with Foston Musik. Later in the year 2014, he did a remix of the song Girlie O; which featured Tiwa Savage.